"A menagerie, with eight enormous dogs, three monkeys, five cats, an eagle, a crow, and a falcon: and all these, except the horses, walk about the house, which every now and then resounds with their unarbitrated quarrels, as if they were masters of it." 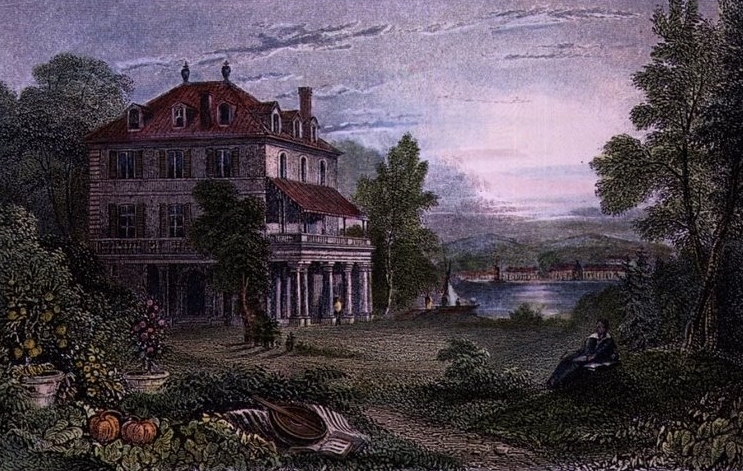 In 1816, Lord Byron rented the manor known as the Villa Diodati, near Cologny, on Lake Geneva. The house already had solid literary credentials. Its original owner, Giovanni Diodati, had translated the Bible into Italian and French, and the poet John Milton (whom Mary would quote in Frankenstein) vacationed there in 1639. The villa still stands. 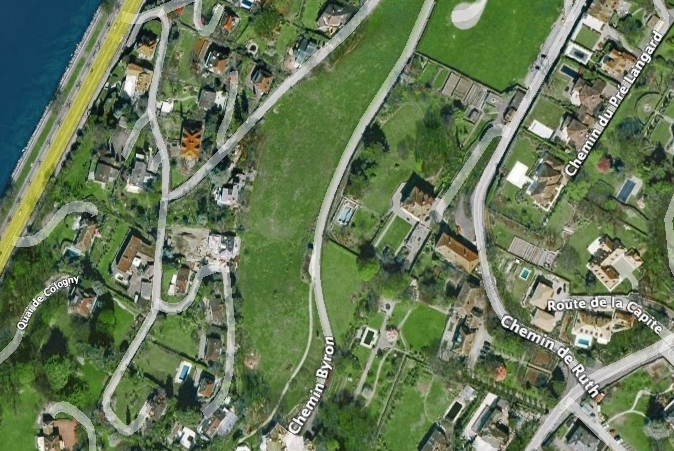 It is the square building, right of center, in the GoogleEarth image below. "Milton and the Villa Diodati", William S. Clark, Review of English Studies, 1935:os-XI: 51-57. Mr. Clark conducted thorough research into the land records of the village of Coligny, where the villa stands. The land for the villa was vacant when it was bought by the Diodati family in the waning years of Milton's life, and the villa itself was not built until well after Milton had died. Even the most cursory glance will show that the architecture is mid-18th century, not mid-17th century. The villa was mostly known as the Villa Belrive (and in fact, Mary calls it this in Frankenstein); apparently it was Byron who christened it Diodati after the name of the family he leased it from. The presence of the placque at Villa Diodati "commemorating" an event that never happened proves only that enthusiasm can trump history, especially when tourist money is involved.